Taking the extra time now to ensure your summer recreational vehicles are safely stored will be worth it later. As we prepare for another New England winter, take time to secure safe winter storage for your summer recreational vehicles. Whether you have an RV, boat, motorcycle, or even a summer-only car like a convertible, taking precautions now will leave you ready to roll again come summer. Keep it clean. Take time to tidy up the inside and outside of the vehicle. Make sure it’s clean and dry before storing; even a small amount of moisture can cause mold or rust. Washing and waxing the exterior provides added protection. Go small to ward off big. Carefully inspect the vehicle for small repairs you can make now that will ward off big headaches later. Reseal cracks, remove or loosen belts to avoid cracking, change the oil, lubricate moving parts and add anti-freeze solutions where needed, such as windshield washer, cooling systems, radiators and plumbing systems. Fill ‘er up. Fill fuel tanks and add a stabilizer to prevent rust and corrosion. Seal it. Cover or seal openings that might allow pests to seek shelter. You’d be amazed how much damage even small intruders like mice can cause, from shredded upholstery to chewed wires. Get a charge. Fully charge and disconnect the battery or completely remove it to prevent winter draining. Store your seasonal summer vehicle in a secure, dry location so it’s not vulnerable to theft or weather damage. 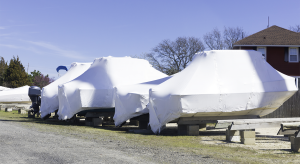 If it will be exposed, you’ll want to get a cover to avoid rust and corrosion. Some of our customers ask us if they need to continue their insurance coverage for their recreational vehicles in the winter, and the short answer is yes. While you may not be using them in the winter, you still want to ensure you are covered in case of theft or damage. Talk to us about your plans and we can recommend the appropriate coverage. For example, there are lay-up policies for things like motorcycles that suspend all coverage except for comprehensive, so you are covered in case of damage or theft. Taking the extra time now to ensure your summer recreational vehicles are safely stored will be worth it later. When warm weather comes back around, you’ll be that much closer to fun in the sun!